Tile cleaning is tough work. Grout cleaning is even harder, especially, if you’re using a toothbrush and elbow grease, but a quick phone call or email to schedule tile and grout deep cleaning services with Clean Sweep can change all that. Stop scrubbing that dirty, disgusting grout with your toothbrush! Let Clean Sweep do the dirty work for you. New technology allows us to remove years of soil, food and soap residue. Stop using the old mop and bucket and see what Clean Sweep can do for you. Our trained technicians use specialized equipment to extract deeply embedded dirt and grime, thoroughly cleaning and sanitizing your tile, grout, and baseboards. We use nonabrasive yet effective methods with adjustable heat and pressure for deep-down clean. 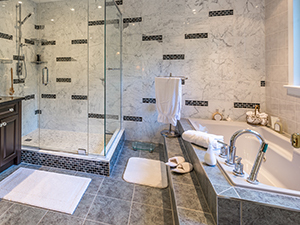 We service tile and grout floors, shower walls, tub surrounds, hot tub surrounds, pool decks, table tops, and more in both residential and commercial properties throughout the Bakersfield, CA area. Apply a permanent sealer to your grout, porous tile, stone, pavers, etc. only once and eliminate the messy and costly re-application of stone sealers every 3-5 years. Clean Sweep Stone and Tile Care uses an advanced penetrating sealer and technique that penetrates stone, tile, concrete or grout deeply (up to 1/4″). A chemical reaction bonds the silane molecule to the latticework of the stone or concrete forever, creating a permanent seal. It never has to be reapplied. Our service is perfect for glass, granite, marble, concrete, travertine, slate, brick, grout, pavers and limestone. No matter how stained or damaged your grout may be, we can effectively clean, prep and recolor your floors, counter tops and showers to like new condition for a fraction of replacement cost. Our unique process allows a strong bond between the new color and your old grout which means years of stain resistant easy to clean grout. Check out our Tile & Grout Cleaning and Sealing Packages and book your appointment today. And if it ever peels or flakes, we’ll fix it for FREE!!! For a FREE estimate on tile and grout cleaning, grout sealing, and grout color sealing services throughout Kern County and the Bakersfield, CA area contact us online or call (661) 833-1168 today.